A few readers have e-mailed to ask for more information about the book by David J. Sheskin we alluded to in the comment reply re: the Statistical test advisor, last week. 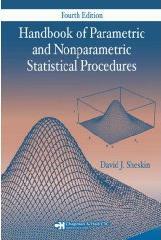 The book is the Handbook of Parametric & Non-parametric Statistical procedures, by David J. Sheskin, ISBN: 1584888148. We have the third edition of the book which runs to over 1,200 pages -- a phenomenal piece of work for a single (obviously very dedicated) author. While it’s not a book you would sit down and read cover-to-cover, it is a very readable reference guide, covering all the parametric and non-parametric statistical procedures included in Analyse-it. For beginners the book starts at the very beginning, introducing summary statistics such as the mean, median, then moving on to explain concepts such as measurement scales, central tendency, variability, normal distribution, hypothesis testing, parametric and non-parametric statistics. The text is concise, but is clear, easy to read, and easy to understand -- ideal for anyone needing a refresher course on statistics. Over 130 statistical tests for univariate and bivariate data are then covered, including ANOVA, Chi-Square, t- test, Mann-Whitney, Wilcoxon Signed Ranks, and many more. The historical background, purpose, use, assumptions and interpretation are explained, with examples to demonstrate real-world use of the test in business, education, life and environment science applications. Again, the text is very easy to read, and the extensive use of examples really helps to demonstrate how the tests are used in practical situations. For experts the book includes formulas (without resorting to proofs) and explains how to calculate each test and statistic. References to further reading are included but aren’t needed as this book covers each procedure so thoroughly. Of all the books we've read, this is hands-down, the definitive guide for univariate and bivariate statistical analysis. We haven't found another book so comprehensive and complete, yet easy to read and understand. The author really does succeed in his aim: to provide a comprehensive reference for readers at all levels. The fourth edition of this book was published last year, with over 500 new pages, now covering topics such as multivariate analysis, clinical trials and survival analysis. You can read more about the book and buy it online at Amazon (UK) and Amazon (US).